I recently came back from a whirlwind adventure to Portugal and Spain and one of our must-see stops was Barcelona. I had heard a little bit about their amazing architecture but did not know what to expect. What I saw were awe-inspiring buildings and fantasy like structures that only a mad genius could dream up. 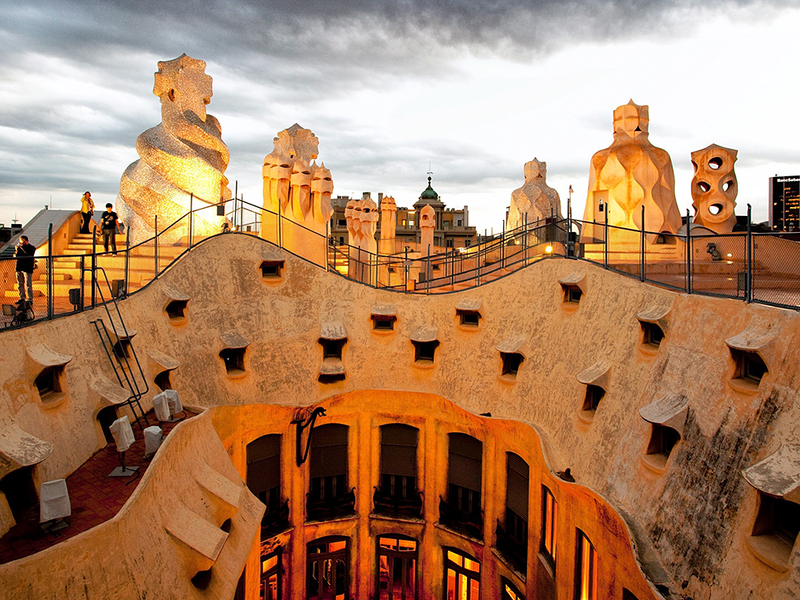 Antonio Gaudi, is the architect behind many of the famous buildings in Barcelona. Our first day, we wanted to stop by one of his most famous works, La Sagrada Familia, a Basilica that has been under construction since 1882 and is expected to be completed in 2026 or beyond. Once completed, it will be the tallest church in the world. We took the subway from Plaza Espana and it was a quick 10 min. ride to get there. The transportation system in Barcelona is easy to get around and is super efficient whether by subway or bus. There was a long line up when we got there so if you do not want to hang out in the hot sun for hours to get a ticket, buy your ticket online which gets you to a much quicker lineup to get in. As soon as you walk up to it, it’s an incredible looking structure where the walls seem to drip like melted candle wax and every square foot is covered with something to look at. Gaudi took much of his inspiration from nature and La Sagrada Familia is designed using highly sophisticated mathematics and advanced structural engineering. The outside of the Basilica may not be to everyone’s taste, but it’s hard to argue that the inside is so breathtakingly beautiful with its intricate ceiling designs and columns. In the afternoon sun, the light comes in through the stained glass windows and casts an amazing glow bathing the large open space inside with soothing colours. Our next stop on the Gaudi list was La Pedrera, a commercial and residential building with the showstopper on the roof. The roof is an undulating expanse of tall structures resembling medieval knights and wide swirling structures. There is a musem dedicated to Gaudi’s work in the top floor that houses some furniture reproductions of his unique style which are mostly made out of wood and has indentations that are contoured to the body form. There is also another floor that is a re-creation of an apartment for a Barcelona middle-class family living in the early twentieth century. It’s a very large space with beautiful fixtures and architectural moldings that would not look out of place today. Our last stop for seeing Gaudi’s works was Park Güell. The original use of the park was for a housing development but was unsuccessful and is now a worldwide tourist attraction with over 9 million people visiting it a year! To put it into perspective, about 1,200 visitors walk through the entrance every 15 minutes. Experiencing Park Güell in person can leave you feeling like you were in some enchanting dreamy playground. There are two gingerbread type houses at the entrance followed by two curving staircases with a colourful mosaic dragon fountain down in the middle. A few steps up is a large forest of 88 stone columns with beautiful mosaic patterns when you look up. It’s a lovely refuge from the blazing sun and a peaceful spot to hang out in. There is an expansive open area that has a curved bench wrapped around the perimeter covered in more mosaic tile. It’s a beautiful sight with all of its curved lines and provides a spot to sit down and view the amazing panorama of the city below.